Ken Turner, Excalibur Project Director. My primary role is to manage our immensely talented team and with their help, drive the project forward. Additional roles include programming, design, level construction, play testing, bursting into song ... whatever it takes to keep the Excalibur project moving along the path to success. The most important reason is that we believe that Excalibur will be fun (and marketable). Also, IMHO I think that third person medieval action/adventure lacks a genre defining product or franchise that has truly captured the imagination of the gaming public. This is our ultimate goal. We believe that some of our gameplay innovations will be a significant step towards achieving this but we are continuing to aim higher. 3. Excalibur is powered by the Auran Jet engine. Do you think the engine is powerful enough to compete with the likes of id's upcoming "Doom3" engine, Epic's Unreal Warfare engine, and Monolith's LithTech 3.0? Id, Epic and Monolith are the big-guns in licensed game technologies and each have their own strategic plans regarding feature-set, performance and customer support. Currently, the Auran Jet team are working closely with the Excalibur developers to ensure that our technologies will be seen as being competitive in the market place at the time of release. This will allow Excalibur to be compared to its competitors on a predominantly gameplay level. 4. Are there any plans to "port" the game to other platforms? We are currently single-mindedly focused on making Excalibur the best PC-CDROM title that we can build. That being said ... never say never. 5. How much customization with the player have over the creation of his character? At this stage, we allow the player to choose from a number of character meshes and customize the face texture, hair, skin and clothing colors. 6. Will Excalibur be the first game to utilize the Auran Jet engine? Auran currently has two shorter projects in production (Trainz and Hârn DE) which are scheduled to ship before Excalibur. 7. Will the Auran Jet engine take advantage of DirectX 8, GeForce 3, etc? Most certainly! We are all entering an exciting age of rapidly escalating graphics processing and Excalibur will be along for the ride. The Auran Jet team have been working feverishly for some time preparing the foundation level support for the new technologies. Right now, the Excalibur developers are remoulding the systems to best utilize these new features. 8. Can you give us an overview of how the multiplayer action will work? 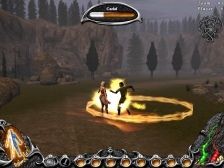 The Multiplayer games take place on dedicated self-contained maps, each set in one of the 3 realms in the single player game. Game types include variations on much-loved FPS multiplayer modes, as well as a few new ones. In all, solid team play is the key to success. 9. Will the singleplayer aspect of it have a deep and involving storyline? There will be the depth for those who go looking, but it will not get in the way of those who don't. We've been putting a huge effort into the justifications for the events within the game that the player will experience and the complications that they need to overcome, as opposed to crafting pages of dialog and narrative for the player to read. The story that the player writes as they go will unfold before them to reveal the strong, simple themes that we have 'water marked' into the levels. 10. Should this game be classified as a RPG? Excalibur is an action game. The player will learn and hone their skills with the spectrum of weaponry throughout the game and graduate to the multiplayer arena. The journey will be a test the player's virtues, not their character's. 11. Is there a release date? Excalibur is currently planned for release in 2002. Just that you should "Watch this space". The next few months will be exciting times for Excalibur. We'd like to thank Ken Turner for giving his time to answer the questions and give us some enlightenment on their upcoming game :).